and an official chapter of the international Star Touring and Riding Association. We gather at least once a month for fun and group rides to build a spirit of camaraderie with like minded individuals and families. We keep it safe, we keep it fun, and we keep it family friendly. Riders of all bike brands, genders, and nationalities are welcome to join us. 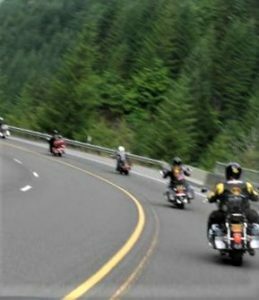 We invite you to come ride with us and see if we are the type of group you would like to become a member of and ride with for years to come. We are always welcoming new members! Look at the list of upcoming meetings and events, click the next chapter event for time and location details, then just show up! Click on any of the menu options above to learn more about us, what to expect when you ride with us, and if you like what you see after visiting with us, how to join our chapter as an official member of STAR. As an official chartered chapter of STAR, our Mission Statement is, “To pursue, promote and protect the interests of motorcyclists; to develop better and more enthusiastic relations between the general public, the media and the operators and riders of motorcycles; to encourage rider participation in events; to promote motorcycle safety and camaraderie among members; to promote organized events; and in general, perform them in a lawful manner.” We encourage you to become part of this mission with us and let us be your Portland, Oregon motorcycle riding group. Click on any event for more details. Click the “+Google Calendar” button at the bottom to add these events to your own google calendar. Welcome to the STAR Chapter 146 website. This website is privately owned and operated by Portland, Oregon Chapter 146 of the Star Touring And Riding Association. Access to the forums is reserved for STAR members. All forums are family oriented and carry a “G” rating. The forums are designed for the enjoyment and participation by all family members, regardless of age, and without the need for parental or STAR censorship.